I think I finally realized why so many people just love their oatmeal in the morning. I know many bloggers and non-bloggers alike just have to have their morning bowl of oats. Since my stomach can be a little iffy with them and since they must be certified gluten-free, I just never really got into the whole big bowl of oatmeal craze. However over the last few months that changed once I started making batches upon batches of granola! As you can see my love for the humble oat has been increasing exponentially. But I still had yet to make a simple bowl of hot oatmeal! I needed to get on that and I was able to when the lovely folks at MyOatmeal provided me with my own custom blend of oatmeal and a package of PB Lean (which I’ll get to later). When you enter the wonderful MyOatmeal.com site, you have the option to create your own custom blend of oatmeal (or choose a popular or seasonal blend). Obviously I wanted to create my own! There are about a gazillion (yes, that’s a word) options to choose from. You get to pick the type of oats you want, the flavorings (all non-gmo, vegan, and gluten-free), fruits, nuts, seeds, other extras, additional protein powders, sweeteners, the size of bag you want, and even how frequently you want your blend sent to you. Finally you get to name you custom blend and make it famous! What did I choose? My oatmeal blend included: Gluten-Free Quick Oats, Black Figs, Banana Chips, Chia Seeds, Natural Cinnamon Roll Flavor, and Monk Fruit Sweetener. I called it Fruity Cinnamon Roll 😉 All I can say about it is this…BEST OATMEAL EVER! I am obsessed! It is so good! What took me so long to have oatmeal!? It is simply magic in a bowl ramekin. This little ramekin of goodness was topped with smooth creamy peanut butter and of course a hefty dose of cinnamon. I could literally eat this everyday! But of course, if I did that, I would miss my beloved pancakes! Which brings me to these babies. 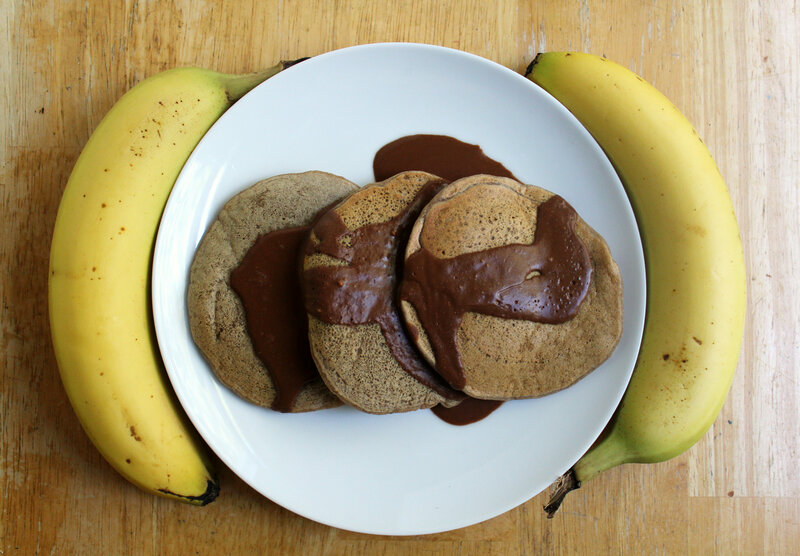 Banana Butterscotch Pancakes with Chocolate PB Lean Sauce! First, what is PB Lean? Well, it’s powdered peanut butter of course! Just like Peanut Flour which I use all the time, only at MyOatmeal you can customize it by adding flavors and extras just like the oatmeals! I’m a chocolate lover and usually mix my peanut flour with cocoa powder. So That’s what I did with this mix. I got chocolate flavored PB Lean! It is also great as a protein powder in smoothies and the like. But of course I used it in my pancake sauces! I used it in a with some cocoa powder and butterscotch extract in this recipe and it was fabulous! So are you ready to read the recipe for these delicious cakes and sauce? I am! + In a bowl, combine the flours, baking powder, cinnamon and stir. + In a separate bowl, combine the extract, banana, and stevia. mash together very well and then pour into the flour mixture. + Now add the 1/2 cup of water to the flour and banana mixture and stir until you get a smooth pancake batter. Let sit while you heat a non-stick pan greased with coconut butter over medium heat. + Once the pan is hot, add 1/3 of the batter to the pan. Cook for 3-4 minutes, flip, and cook an additional 3-4 minutes. Repeat for the rest of the batter. + To make the sauce, in a small bowl combine the PB Lean, cocoa powder, and extract. Then slowly add you water. You may need more of less depending on the thickness you want for the sauce. Stir and let sit. Then top your cooked cakes with the sauce and DEVOUR! So many good foods in this post! 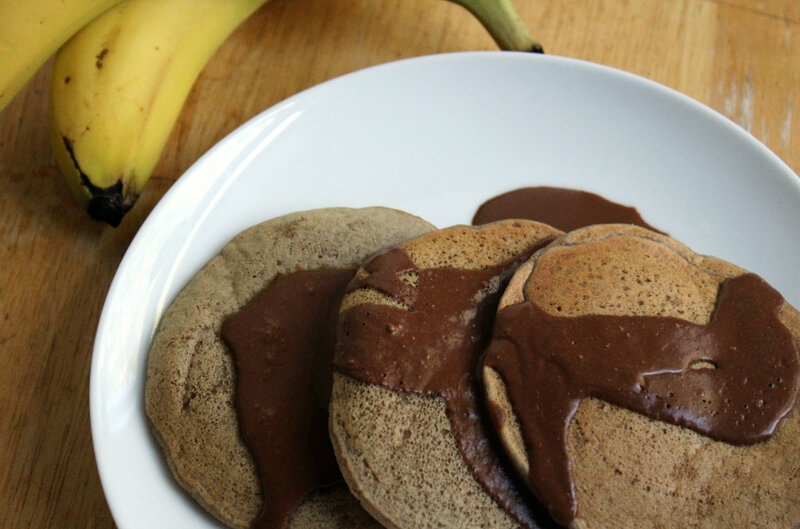 Oatmeal is to die for and so are these pancakes and PB Lean. Want to try it for yourself? MyOatmeal is offering my readers a 15% discount on all orders with the code: healthy15. Just use that at check out and you’ll be good to go. Get crazy and customize to your heart’s desire! + What would you put in your custom oatmeal or PB Lean blend? + Are you a die-hard oatmeal fanatic? Does your day just not start without your morning bowl of oats?